I opened my workshop thirty yeas ago, in 1984 and in my first years of activity I built guitars inspired to J. Ramirez and M. Kono models. During these years I had the very special opportunity to see and hear the very 1867 Torres guitar owned by C. Aubin that was also the model for R. Bouchet and D. Friederich. In 1993 after a guitar making course held by J. L. Romanillos having as a subject the 1912 M. Ramirez guitar (the guitar of A. Segovia), I also had the opportunity to hear an original 1911 M. Ramirez guitar. From that moment, this kind of guitar became the basic inspiration of my work, that in these first years has mainly been oriented to the restoration of historical guitars like M. Ramirez. E. Garcia, F. Simplicio, and Hermann Hauser. Since those days I begun a systematic research looking for as much information as I could find on M. Ramirez, his guitars, using books, articles, printed material and any other support I could find, visiting museums and collections, etc. This mass of work provided me not only with a set of crucial information and experiences on the work of this great master, but also with something more intangible and very subtle notions on his guitar-building style, skills, and secrets. However, my guitars are not simple copies of Ramirez, Garcia, Simplicio, or Hauser’s instruments. Instead, following the stile of these masters, I produce new instruments aiming to satisfy the musical and technical exigencies of today. The combination of closeness to tradition with a long research, a great care, exactitude, and accuracy of the methods I use allow me to produce guitars focussing on a “beautiful voice” and “playability” to offer to the artist a maximized colour palette and expressivity of the instrument. 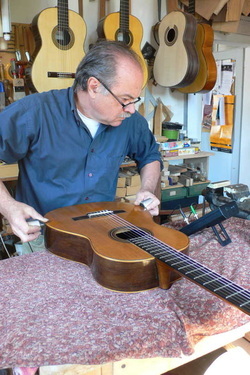 My guitars are built in a workshop with controlled air humidity that guarantees both a better stability of the wood, and the consistency of the construction process .The woods are air seasoned for several years (soundboards for a minimum of 25 years, Ebony fingerboards for 30 years, and rosewoods and mahogany up to to 50 and 60 years). The guitars are rigorously finished with shellac French polishing, ensuring the best shellac quality.